As soon as I stepped out of the airport, it was love at first sight. There are convenient buses right at the airport exit which, at a great price, take you to the heart of the city centre. This short journey is already spectacular in itself: gorgeous views, monumental palaces, castles that stand in the sky in the distance, make this lovely city truly valuable, which defines it as the modern, cosmopolitan capital of wonderful Scotland. 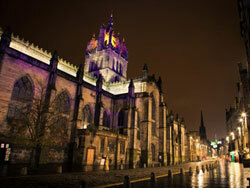 Scotland’s historical and cultural capital is a must see in Great Britain! 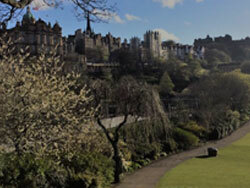 It is the perfect place to experience and discover the Scottish culture and its welcoming people. Passionately valuing the history of the Scottish people, Edinburgh is also a vibrant and dynamic city that will charm anyone! From its impressive towering castle now home to the Scottish Parliament and the National War Museum, you can stroll down the Royal Mile, the oldest street in Edinburgh connecting the castle to the Palace of Holyrood House, up to the busy town centre.